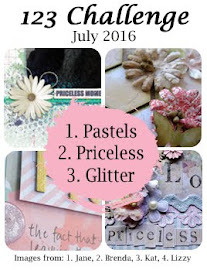 This month over at 123 Challenge challenges us to use pastel colors, the word PRICELESS, and glitter. I inheretited a box of items from my cousin's estate recently, including many old photos of my kids. Some of these photos I have never seen, even though my cousin and I were very close. These photos are of my daughters playing dress-up, a favorite activity of theirs when we'd visit. I played around with paint. It turned out a bit of a mess, but that's what happens when you experiment sometimes! I used pastels, and covered my title with some pink glitter. Love your take on the challenge. Thanks for joining in at 123 Challenge Blog. This looks wonderful.. love that background color! Thanks for joining in with the 123 Challenge blog for July! Fabulous take on the challenge. I love the glitter title. Thanks for playing along with the 123 challenge. Such a lovely and bright page. Thank you for joining in with us at 123 Challenge Blog. Great background, great layout. thanks for playing at 123 Challenge Blog.